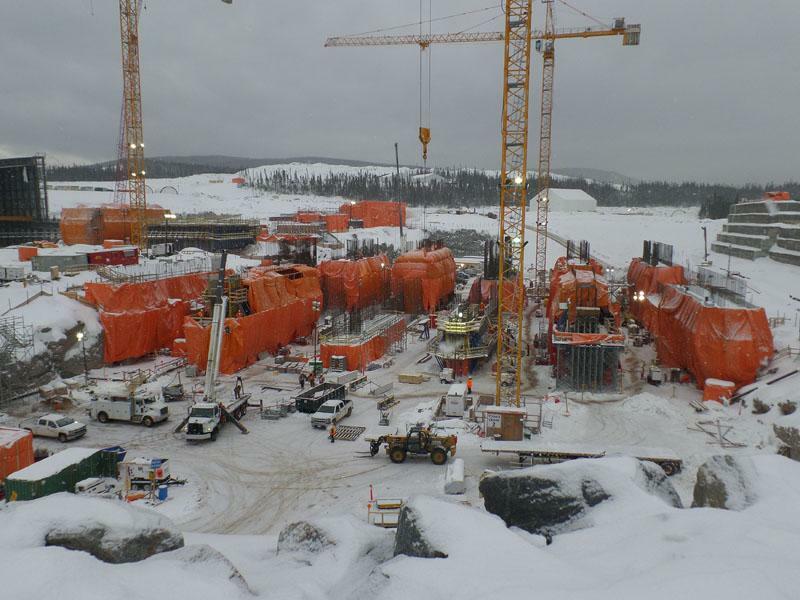 In the construction of the 824 MW Muskrat Falls hydroelectric power station in Labrador, Canada, extreme cold is a particular challenge. Temperatures as low as -40°C are not uncommon at the site. These conditions require accuracy and expertise at the highest level in terms of planning and implementation. 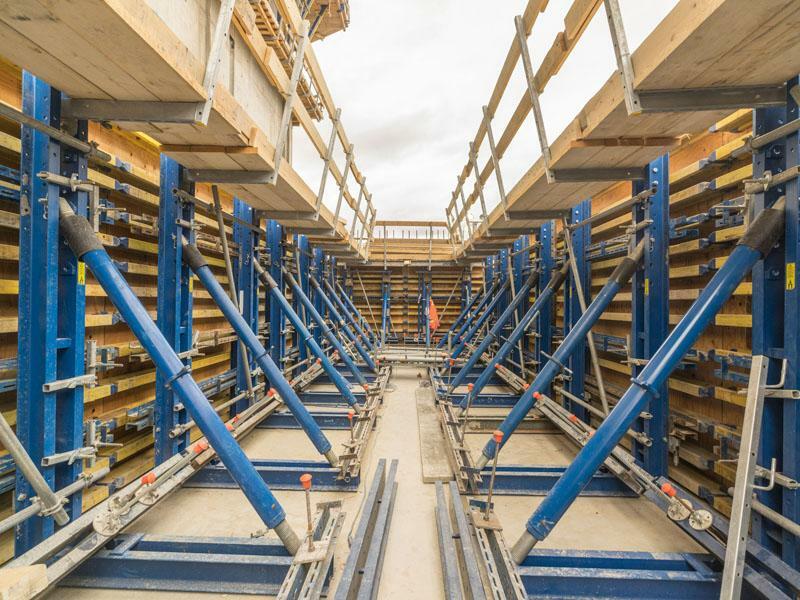 To meet these challenges, Doka is providing the formwork solutions and is setting new standards with its innovative Concremote system. The Muskrat Falls Hydroelectric Generating Facility is located on the Lower Churchill River in the province of Labrador. Once operational, it will power homes and businesses across the Canadian provinces of Newfoundland and Labrador. The hydroelectric power plant consists of a generating plant, four turbines, a central dam and adjoining north and south dams. In the power house there are four power plant units, each of which has a 206 MW Kaplan turbine, an inlet, a half spiral and an intake manifold. A total of five spillways are being built to prevent flooding. 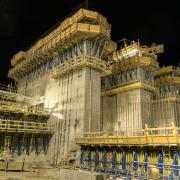 The construction firm Astaldi Canada has selected Doka as its reliable partner for formwork. The client's prerequisite for awarding the contract was 100% documentation, high-precision and zero-fault tolerance. A project of this magnitude requires customized solutions and an immediate response to rapidly changing weather conditions. The housings and formwork systems must be largely heated. Storage and assembly is not possible on site due to the extremely low temperatures. The first snow falls in September and remains until the end of June. For this reason, the individual components weighing many tons were pre-assembled and transported 2,400 km by truck from Toronto to Muskrat Falls – in a masterpiece of logistics. Accurate work and precision planning were thus critical in the preparations for the project. Another challenge is the formwork for the turbine’s outer walls. The walls have to be shaped into a precise hydrodynamic form, which requires the utmost perfection in the interplay between the concrete surfaces and steel. The formwork is constructed so that steel mounting parts can be easily attached. In some areas, special formwork was adapted precisely to the steel liners. Short-term modifications, for example, due to changes in the weather, were managed successfully with just-in-time delivery of formwork materials. 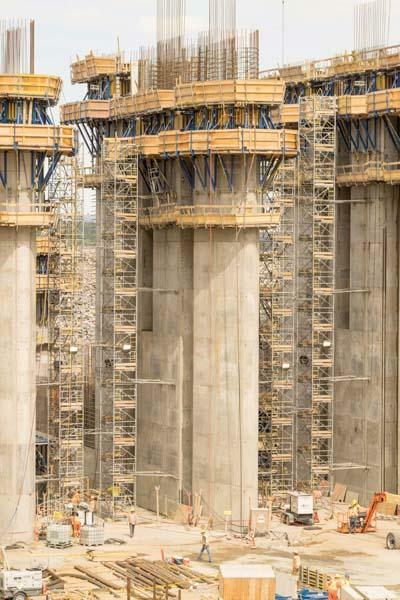 Doka’s customer-oriented service team was able to respond rapidly to requests for changes. 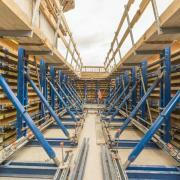 The complete formwork range from Doka is on display at site. The Large-area formwork Top 50 is combined with the high-performance Dam formwork D22 to build the asymmetrically-shaped concrete structure. The slabs for the powerhouse, which are up to 4 m thick, will also be formed using Large-area formwork Top 50, with support of the Load-bearing tower Staxo 100. The Staxo 100 system has been especially designed for very high loads and is therefore ideally suited for the construction of this type of structure. In addition, Framed formwork Framax Xlife is being deployed, as well as various tie rod systems and support trestles. 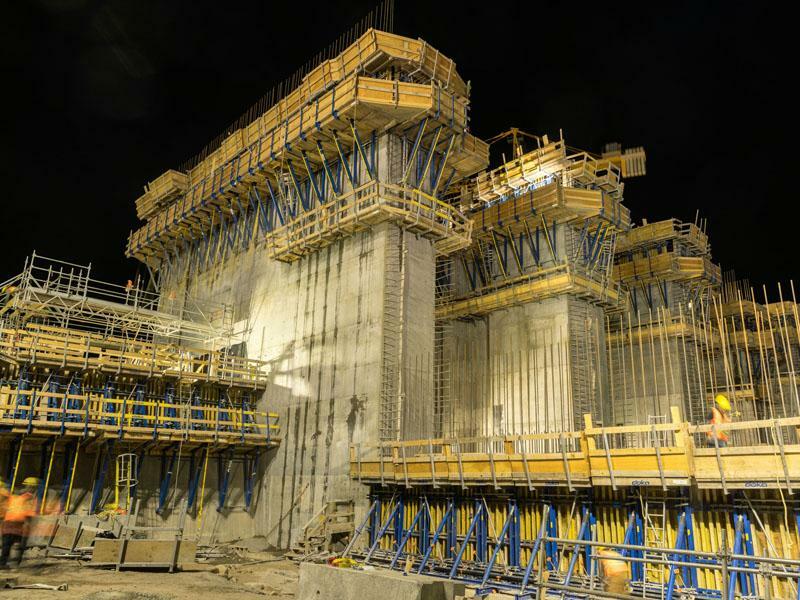 The pre-assembly in Toronto was carried out primarily for the Large-area formwork Top 50, the working platforms and for specific special formwork for the turbine outer walls. 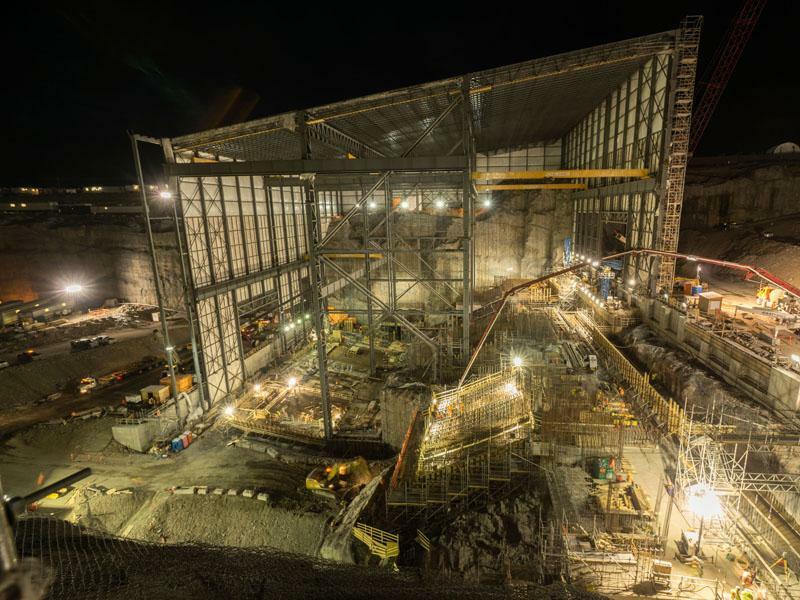 At the time of project completion, Doka will have about 5,000 working and protection platforms and over 16,200 m² of Large-area formwork Top 50 on site. 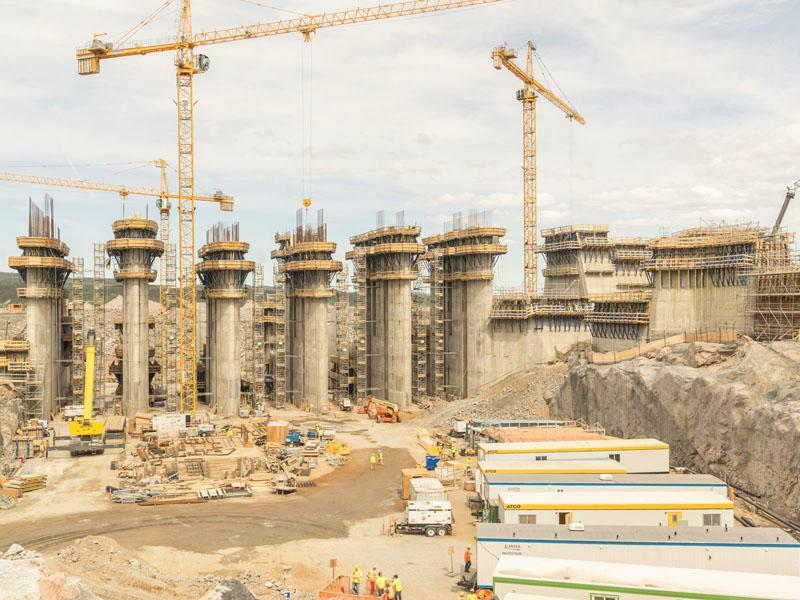 "I have 35 years of experience in this field, but the site at Muskrat Falls is clearly the most complex and challenging project that I've ever been involved in," says Peter Friesenegger, Head of the Engineering Department at the Amstetten headquarters. Indispensable support is also being provided in these special weather conditions by the international award-winning Doka innovation Concremote. This technology enables real-time online measurement of both, concrete strength and temperature development. The concrete strength development, for example, enables users to calculate striking times, treatment times and prestress points. Measurement of thermal changes is important in order to monitor the stress caused by temperature differences in a component. This helps to prevent cracks and subsequent damage to the building. Doka Concremote concrete monitoring enables users to take the right steps on the basis of concrete strength measurements, and thus to secure and accelerate the building process. 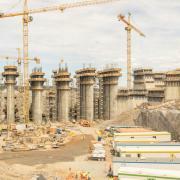 Muskrat Falls is currently the world's largest Concremote construction site. Doka offers an impressive complete package, consisting of planning, detailed engineering, pre-assembly, formwork instructors and on-site engineers. Doka is also a reliable and experienced partner, even under extreme conditions, and was already integrated closely in the planning process. Construction began in early 2014 and the planning work continues to run in parallel today. 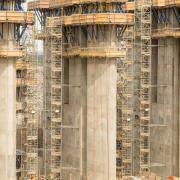 In doing so, Doka engineers define the optimum formwork solution for each phase of construction. Engineering teams in Canada, the U.S. and Austria collaborated to design solutions for this massive on-site project. Support from Doka headquarter in Amstetten, Lower Austria required up to15 technicians worked on this complex project at peak periods over a total of 20,000 working hours at the headquarters in Amstetten, Lower Austria. By way of comparison, the annual workload for a technician is 1,700 hours on average. In addition, there were ten to twelve local employees in Canada, who were also commissioned directly with planning tasks. Especially in such a complex and challenging project, the issue of safety is a top priority. For this reason, Doka Service Engineers are assigned directly to the construction site in order to ensure high safety standards and to train staff in dealing with Doka safety products. All D22 climbing platforms have integrated ladder systems and stair towers in order to ensure personnel can work safely on the platforms. The Load-bearing tower Staxo 100 ensures safe ascents and descents by way of ladders featuring non-slip rungs and continuous railings integrated into the frames. Personal safety is assured by attachment points for personal protective equipment. Flexible handrail clamps in the transition areas, as well as pre-mounted platform linings provide maximum safety on the construction site. The hydroelectric power station has been designed to meet strict environmental requirements and its sustainable structure has been certified by LEED (Leadership in Energy and Environmental Design). With an output of 824 megawatts, the hydroelectric power station will supply the provinces of Labrador and Newfoundland with renewable energy, using about 40% of the power generated. A further 20% will be used to supply Nova Scotia, and the remaining 40% will be exported to Atlantic Canada or New England. The commissioning of the hydroelectric power station in Muskrat Falls will allow for the closing of a coal-fired power plant in the province. This represents a major step toward sustainable environmental protection. 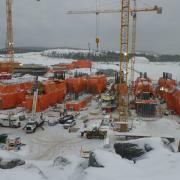 Thank you for your interest - Doka Formwork at Hydroelectric Plant in Icy North. 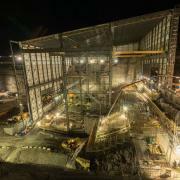 Thank you very much for your interest - Doka Formwork at Hydroelectric Plant in Icy North.